Max Weber characterized the history of the West as the “disenchantment of the world,” which he described as the progressive “fleeing of the gods.” I am interested, in Debunk Me Not, in chronicling the process by which a consolidation and institutionalization of “the scientific method” participated in that disenchantment not only in its challenge to religion, but in its debunking of spiritualism, which represented an alternative way of understanding and inhabiting the world. While there were certainly practicing spiritualists who were simply frauds, and many people who believed literally in spirits, I am interested in the ways in which spiritualists sought through their “magic” to represent alternatives to materialism as they sought a variety of ways to make sense of an unknowable world. Over the course of the project, I show that spiritualists were abolitionists, suffragists, women, people of color, and people of non-normative sexualities. Contending that the sciences and humanities have jointly participated in the modern project of emptying magic from their objects of study, I seek to restore the enchantment they worked to expunge. Exemplifying these tensions, the magician Harry Houdini is the presiding spirit of this dissertation and will play an even larger role as I begin to turn my dissertation into a book. I might say he enchants my project, since the idea for my dissertation grew in part out of my experience attending the Broken Wand/Kaddish Ceremony held on his yahrzeit (Hebrew anniversary of his death) at the graveside, which I was intrigued to learn is located across the street from the graves of my maternal family. That connection led me to interrogate my own investments in this project, which involves understanding not only the way we make sense of the material world, but also how we connect to the past. I begin the project with Houdini, showing how his Judaism shaped his understanding of the “magic” of the world as well as his connection to the past: how, that is, he suffused Talmudic logic with the mysticism of Kabbalah. Houdini is a key player in the history of spiritualism because he amassed an enormous collection of materials on the subject, and yet, was one of its preeminent debunkers. He is also a central figure in the history of science at the turn of the twentieth century because his continued fascination with spiritualism, in spite of his distrust in its methods, represents the conflict between spiritualism and science that emerges during this period. I am interested in chronicling this key moment in which science turned definitely to a disenchanted worldview in part by defining spiritualism as its antithesis. I bookend a project that is historically grounded in the techno-religious movement of nineteenth-century Spiritualism with Harry Houdini because he served as an intermediary figure during a period when the supernatural sciences came to be seen as pseudosciences. Houdini embodied this transitional moment as an intermediary figure between the supernatural and the scientific precisely because of his Jewish lineage, which led him to invoke the mysticism of Kabbalistic Judaism in his theatrical performances and employ the heritage of Talmudic reasoning in his debunking projects. During Houdini’s lifetime, Jewish immigrants were associated with the supernatural in popular culture, as exemplified in (and partly because of) the play, The Dybbuk (1913), which fictionalized a Jewish exorcism. As a Jewish immigrant himself, Houdini struggled with these associations in order to present himself as reasoned modern-day magician while retaining his fascination with the history of spiritualism and the occult. 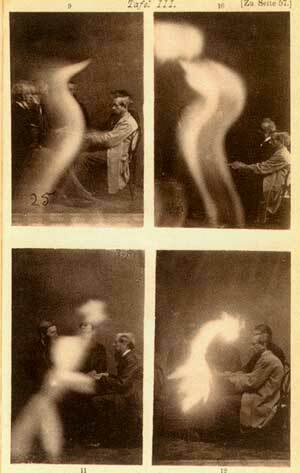 A significant portion of the project is devoted to the historical development of the spirit photograph. Two chapters consider the emergence of this mode of representing the invisible world and provide a way of reading these images as contemporary scholars without ridding them of their magic. In this way, I also depart from Houdini’s ongoing desire to discredit the methods of spirit photographers because I believe there is value in understanding how these images offer an alternative way of inhabiting a world that was comprised of things that had to be taken “on faith” and how these spirits expressed a sense of the world as containing things we could not know. Houdini famously took self-portraits of himself with the spirit of Lincoln using darkroom magic to expose Mumler’s photograph of Mrs. Lincoln as a fraud. He even sent a photograph to a descendant of Mary Todd Lincoln to prove that the photograph was manipulated. In this case, Houdini’s debunking project simply replicates the national story that Mary Todd Lincoln was a mad woman, and I want to complicate this narrative. I argue that choosing to suspend our disbelief in these photographs allows us to bring out aspects of history that would otherwise remain invisible. If we remain preoccupied with exposing Mumler’s photographic methods, for example, we fail to see and take seriously in our national histories the effort of female spiritualists, such as Nettie Colburn Maynard or Mary Todd Lincoln, to challenge rationalism and materialism. Maynard, who penned the expose, Was Abraham Lincoln a Spiritualist (1892), claimed Lincoln consulted her as a spirit-medium for military strategy and that during a séance she instructed him to issue the Emancipation Proclamation. Maynard’s affiliation with spiritualism and the Washington elite afforded her the opportunity to make claims about being an important part of US political history even if she could not vote, run for office, or be an elected member of Lincoln’s cabinet. Her claims are widely discredited by historians and refusing to take her account seriously account raises historical and feminist issues because, as a disenfranchised group, women were drawn to spiritualism, a movement on the margins of dominant religious traditions that allowed for female leadership and empowerment. Similarly, in my chapter on the technologies of Spiritualism, I consider the account of how nineteenth –century spiritualism began, in 1848, when two sisters in Rochester N.Y. reported hearing telegraphic messages from the spirit world via mysterious knockings on the walls of their farmhouse. The Fox sisters insisted that the rapping they heard corresponded to Morse Code and that they were “spiritual telegraphs.” Writers in this moment were familiar with these connections, as I show in my current chapter, which considers the supernatural aspects of telegraphy that are put forth in the telegraphic romance genre, such as Henry James’ In the Cage and Ella Cheever Thayer’s Wired Love: A Romance of Dots and Dashes. Thayer’s work is particularly notable since its introduction is written entirely in Morse Code. It also puts forth queer potential of “online dating,” in which nineteenth-century telegraphers could chat over the wire without truly knowing the gender of the telegraphist at the other end of the line.